Discussion in 'SEO' started by MichaelAaronTaylor, Feb 13, 2019. Hey, can I get some help with my home page and website design page schema code reviewed for feedback? Maybe @deathshadow can help you with that. What is the website link? My first question would be "Affiliates for WHAT?!?" -- there's nothing on the page to give me any idea what the blazes I'm looking at or why I should plug data into it. There is not enough plaintext content inside BODY for SEO to even be a topic for discussion, because ACTUAL TEXT CONTENT is the #1 citizen of the web according to search, and everything else may as well have leprosy. That said, the page is nice and responsive for screen size, the font sizes seem accessible, and there are no real navigation issues meaning you have proper LABEL with FOR attributes pointing at ID's. That might not seem like a SEO thing, but the advice Matt Cutts gave us always applies: "Write for the user, not the search engine" and that means navigable semantic markup with logical document structure. But the lack of numbered headings for document structure, IMG in the markup that has no business there in the first place, and general code bloat may be biting it. ... but really nowhere near as badly as the complete lack of anything remotely resembling actual content to say what that page IS! P.S. Placeholder is NOT a label. oh, I am so sorry, I updated the link and seems I did not do it right lol. I meant to have our main site URL, not our affiliate subsite. Here https://PlatinumPassportsMarketing.com Sorry again for the confusion. Alight, let me go down the normal review list since anything that interferes with users can have a negative impact. First let's talk accessibility -- you have some failings. Specifically the annoying artsy thin-glyph font, and the illegible colour contrasts. Some webfonts have their bars and slabs too 'thin' for good legibility. The garbage "Roboto" font most certainly has this issue which is why I highly advise getting rid of it and sticking to one of the web-safe fonts instead. ...can help with that. Due to font-smoothing technologies I suggest treating everything on your page as needing to meet "Small AAA" at minimum. The next BIG problem is that scripting off/blocked there is no website. Just a big blank white page -- though it DOES allow scrolling so there's at least something there. You don't have a single thing on the page that on a casual inspection even warrants the PRESENCE of client-side scripting, so this broken scripting-off behavior has no excuse to even exist. That goofy scripted load delay and goofy animated garbage does nothing but interfere with accessibility -- and by extension that can't be good for your site's traffic... search result ranking or not! 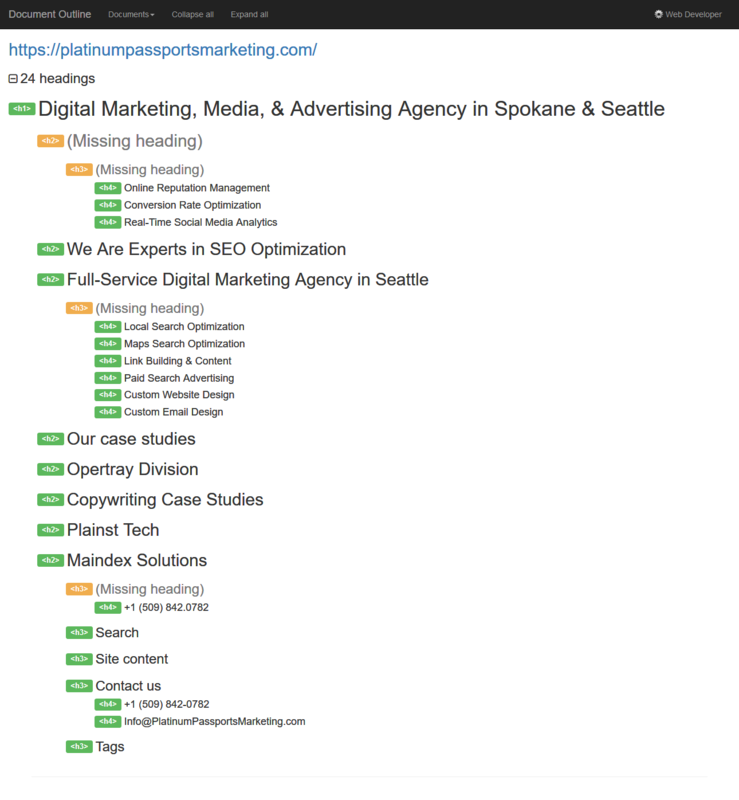 The document structure (numbered headings and HR) are nonsensical gibberish with missing heading levels, heading tags around things that aren't headings (that can get you pimped slapped down in search for suspected SEO black hat abuse!). For example, what makes a phone number the START of a subsection of the page, particularly when it has no content for it to be a header OF! Gets worse since a lot of that text -- like the H1 -- doesn't structurally even make sense. It reeks of someone choosing the numbered headings either for presentational reasons (not HTML's job) or in an attempt to abuse how search handled things twenty years ago! It is agonizingly slow to watch load -- the reason for this is simple; 2.69 megabytes in 108 files. The file count is the bigger worry of the two, though I really have to question -- apart from developer ignorance and incompetence -- with 1.15 megs of JS spanning 28 files and a ridiculously absurd 721k in 21 files of CSS. The majority of websites as simple as yours has NO excuse for more than around 48k in one or two files of CSS! Those file counts though... every single separate file on a website introduces handshaking overhead, something made worse when you go HTTPS. Whilst yes browsers and servers can (theoretically) handle multiple connections, you end up butting heads with the connection limits either from high traffic on the server or local congestion, you quickly find yourself choked out. Case in point here it took upwards of 20 seconds to load... sure if you're sitting on top of the server or have more connection speed than the almighty that might come through in 3 seconds or less, but for many MANY people that page thanks to the sheer number of separate files could take anywhere from 20 seconds to a minute or more! Go to a local popular coffee house with free wifi during peak business hours, leech their free Internet, and you'll see what I mean. ... and that's gonna bite you on your search ranking! Now, WARNING, I'm not going to sugar coat this. The HTML is the typical half-assed train wreck of developer incompetence and ineptitude so common to "when bootcrap developers just keep slopping in plugins". Out of the box Wordpress is a train wreck laundry list of how NOT to write HTML or use CSS, but this takes that to a whole new level. No media targets on the stylesheet LINK, endless pointless separate stylesheets and it STILL ends up slopping static style into the markup where it has zero business being. LINK and META not one legitimate UA gives a flying purple fish about and/or are redundant to other existing META. Keyword stuffing of the META in a manner guaranteed to get you slapped down by search, blocking scripting in the HEAD, endless pointless DIV for nothing, endless pointless classes for nothing, again the gibberish use of headings alongside DIV and SPAN being used to do heading's job, target attributes shoving new windows down user's gullets whether they like it or not, presentational/template images in the markup, comment placements that could trigger rendering bugs in IE and FF, STYLE tags inside the BODY where they are completely invalid, the list goes on and on. Hence the page wasting an absolutely insane 370k of markup on delivering 12k of plaintext and around two dozen content images -- probably not even 30k of HTML's job! That's over twelve times the code that should be used! Between the massive JS for nothing, massive CSS for nothing, and massive HTML for nothing, you can bet your sweet bippy that search is going to give you a full on pimp slap when it comes to how well you rank for anything -- but worse even if people land on the site you're looking at high bounce from the agonizing load times and accessibility failings. It is overburdened with artsy-fartsy effects that have little if any value to users, making the site harder to use, harder to maintain, and destroying any chance at a proper ranking behavior. If you brought that to me as a client, I would tell you to pitch every last piece of it in the trash and to start over from scratch. The document structure failings alone mandating a complete rewrite if you actually care about ranking on search, much less all the other failings and issues. There is little if anything worth salvaging from that mess. But it is ENTIRELY in-line and what I've come to expect out of a site built with turdpress. There's a reason I consider it sucker-bait and those who promote its use for businesses to be preying upon the ignorance and wishful thinking of site owners. It's a cute toy for making a blog for grandma, nothing more, nothing less. Apologies if all that comes across as harsh or "hurtful" -- but that's the truth for you. I don't rap, I don't jive, I just give it to you as it is and how I see it. If you're actually a businessman you'll understand the approach -- it's probably part of what brought you here in the first place. Though it's pure comedy gold; the miserable failure at trying to build a website from both a coding and SEO perspective given the content and subject matter of said site. I would say those who contributed to that site's construction are unqualified to be creating websites for business. -- edit -- and all that's before we even talk about content quality, redundancy, and how it feels a bit keyword stuffed. Stuffing / "keyword research" is more scam than fact and over time more likely to get you another back-handed slap from the spiders. Oh, and as to that "structured data" thing, FORGET IT. Pointless garbage even the Goog doesn't ACTUALLY use, much akin to other dumbass pointless trash like XML sitemaps. If you need to look at the page that way or provide it, there is something fundamentally flawed with the site itself. In fact, I've found that if you can get it to 0:0:0 you rank BETTER. Simply having the data present can in fact HARM your search rankings. Aka the type of people/systems you usually want to keep out of your content! Yes, I say that even with Google pimping it. Let's just say Goog's anti-spam folks, search engine folks, and people making stuff like lighthouse and "structured data" analysis are NOT on the same page when it comes to this. I tend to side with the anti-spam guys since more often than not they win the conversation every single time. Hence why despite all the claims XML sitemaps are more placebo than reality. Hence why you don't piss all over the HTML with the endless pointless classes for nothing derpitude like "microformats" would have you do, or wasting bandwidth on making some sort of stupid "pagemap" crap. Sooner or later the CONTENT is going to need to speak for itself. Content is king... USE IT. This might take me some time to fulling reply haha. First thank you for the feedback and time as this has been helpful for sure! We where already in the works to de-tangle the multi-wordpress installation of the site like one WP for the home page, one WP for service pages, and another WP for the blog from like 5 years ago that was said to speed the site up but it has just been a mess and has really cost me more money having to fix the site after updates. Anyways that is done and we also upgraded our cloud servers from Centos 6 to 10. This has improved our speed test to around 80 but we had 90+ before and we will get it again maybe later today. Still looking into your suggestions/ info for accessibility. You said you can help? Please send me an estimate for that please. Not sure about, "scripting off/blocked" either, so send me estimate for that as well please. "The document structure", I understand some of this issue also with interlinking right? This seems to the larger work load but if you have a proposal for this as well let me know. No keyword stuffing, we are around 1% for density. I understand "structured data" is being used for voice search now. Like FAQs or info graphics.